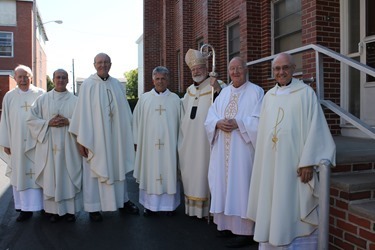 Last Thursday we had one of our regular meetings of the Archdiocesan Pastoral Council. Among the many agenda items was an excellent presentation by Father Paul Soper on the Disciple Maker Index. The Disciple Maker Index is a tool which we used this year to help the parishes in Phase II of our Pastoral Plan Disciples in Mission to prepare to write their local pastoral plans. Catholic Leadership Institute provided us with this survey, which was completed by over 5,200 parishioners in the archdiocese. 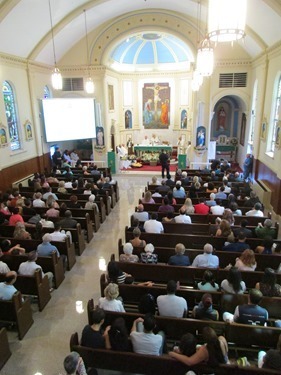 We can look at our own data in the light of national survey data, in which more than 27,000 people have participated, in 92 parishes in 12 Dioceses. The DMI helps us in three ways. First, it helps parishes to understand their current situation, answering such questions as: Do people find the parish welcoming? Are they growing there as disciples? 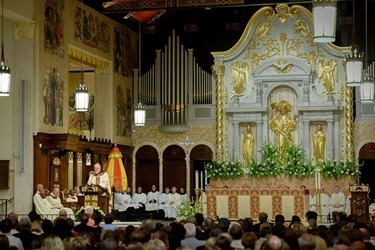 Do the homilies help them to find God in their lives? 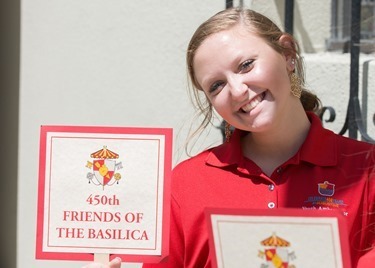 Would they recommend their parish to a friend? Where are they in their own personal discipleship journey? These are key areas that a parish needs to understand as they settle in to write their own plan for evangelization. Second, when the survey is re-administered in that parish several years from now, it will help the parish to understand and measure whether the local plan they wrote is having an effect. 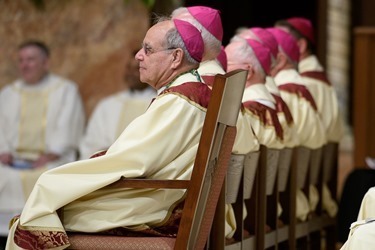 Third, it will help the archdiocese as a whole to understand, over a period of years, whether Disciples in Mission is taking us in the right direction. 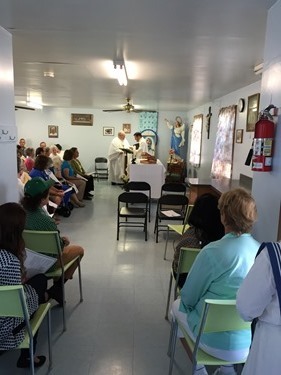 Saturday was the Feast day of Blessed Mother Teresa and I was very happy to visit the local house of the Missionaries of Charity to join in their celebration. 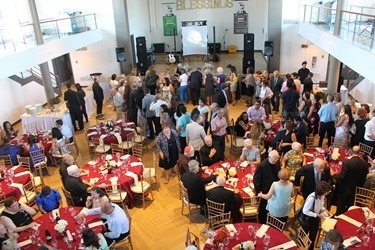 A number of the volunteers and people of the community were there for the celebration with the sisters. In my homily, I reflected on the fact that so many people who were present had had a chance to meet Mother Teresa, or even knew her personally. 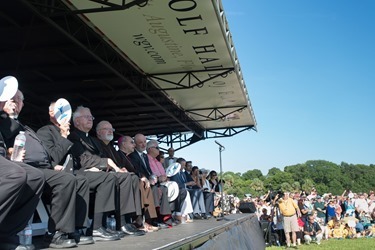 I pointed out that the intention of Pope John Paul II in having so many beatifications and canonizations was to underscore the teaching of the second Vatican Council on the universal call to holiness. 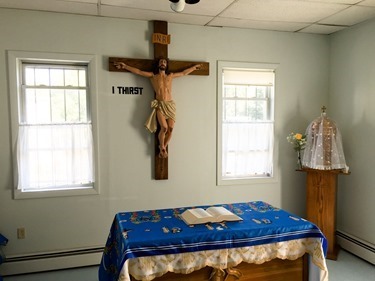 I also reminisced about several different times I had been with Mother and what a privilege that was, and said that we best honor her memory in trying to imitate her commitment to the poor and by supporting her daughters, the Missionaries of Charity. 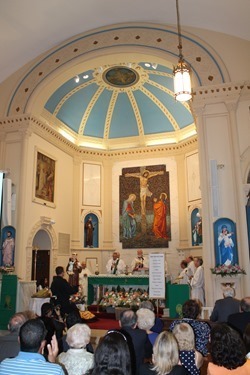 On Sunday I went to St. Anthony’s in Somerville to join in the celebration of the 100th anniversary of their parish. 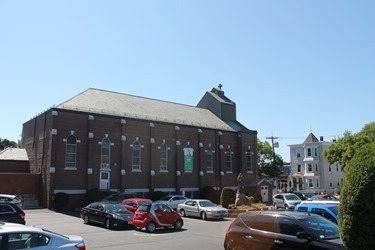 The parish was founded a century ago under the direction of the Scalabrinian Fathers to serve Italian immigrants. 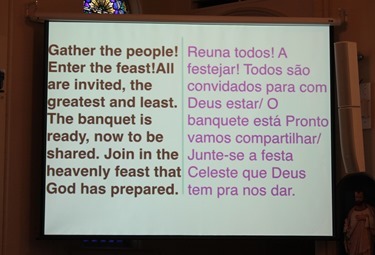 Over the years, in that same spirit of welcoming, the parish has very much embraced the local Brazilian community, which is a large portion the parish, although there are still many Italian Americans there, as well. 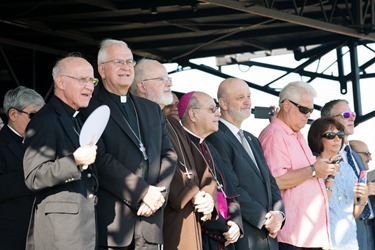 A number of the Scalabrinian Fathers were there for the celebration. The Sisters of Notre Dame have also had a presence in the parish for many decades, first in the school and now pastoral work. 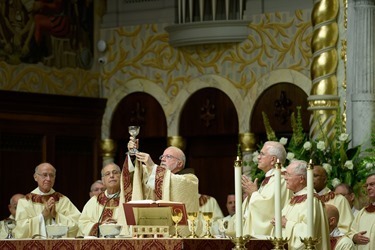 They blessed the St. Anthony Bread and there was a festive meal following the Mass. On Sunday, the leadership of the Jornada Movement, which has come out of the Cursillo Movement, came for a visit. 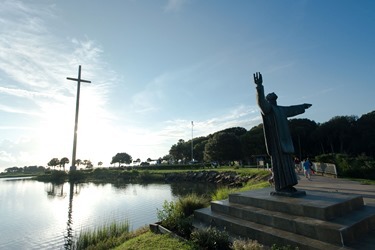 The Jornada, Spanish for “Journey,” is a retreat for Hispanic young people that has been very successful in involving young people in the life of the parish. 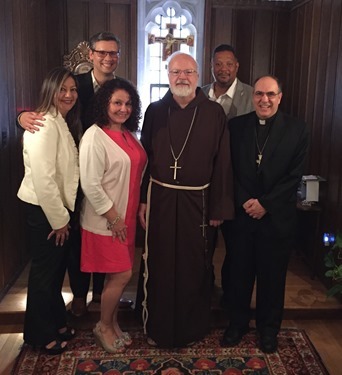 Jornada is a diocesan effort in Brooklyn, but they have helped dioceses in other states to launch similar retreat programs and the leadership from Brooklyn came to offer to help promote this type of activity here in the Archdiocese of Boston. They met with me and Bishop Uglietto and explained more about their organization and how they might be able to help us implement it here. 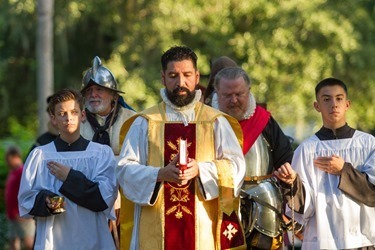 This week was the celebration of the 450th anniversary of St. Augustine, Florida, which is the oldest continuously occupied European settlement in the United States, and I was honored to be appointed as the Papal Legate, which is the representative of Pope Francis, to the celebration. 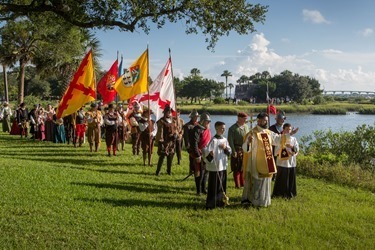 Don Pedro Menéndez de Avilés led the Spanish ashore at St. Augustine on the Feast of the Nativity of Mary, Sept. 8, in 1565 and their chaplain, Father Francisco López de Mendoza Grajales, celebrated the first Mass there the same day. 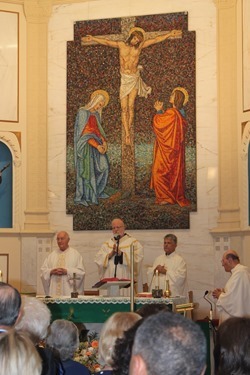 So, on Tuesday, we had a Mass to celebrate the anniversary on the very Feast of the Nativity of Mary. 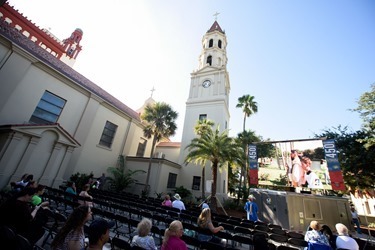 In my homily I mentioned that the mythical fountain of youth that Ponce de Leon was looking for is supposed to have been located in St. Augustine. I said that now we can understand why so many senior citizens come to Florida! 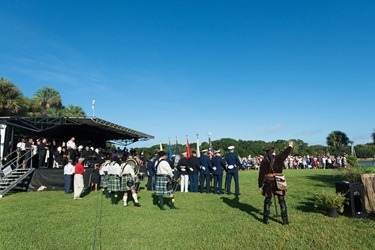 In the morning, before the Mass, there was a reenactment at the very site where the Spaniards would have landed. 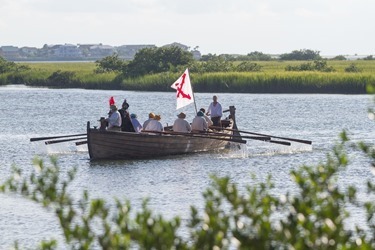 It was quite grand, with people dressed as settlers and soldiers who rowed to shore in boats, replicas of the kind of “chalupas” they would have used. 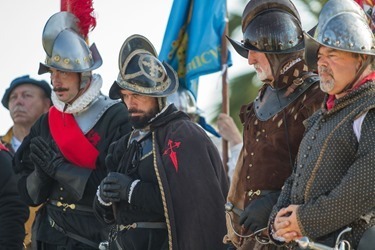 There were quite a number of special guests for the event, including the Spanish ambassador and the Spanish consul as well as a direct descendent of Don Pedro Menéndez de Avilés. 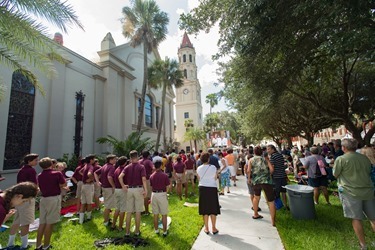 This week, King Felipe and Queen Letizia of Spain also paid a visit to St. Augustine. 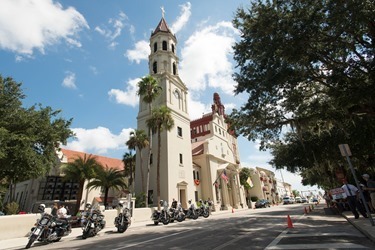 As you might imagine, St. Augustine has a very long and interesting history, filled with a long list of “firsts”: the first permanent parish church in United States (now the Cathedral Basilica of St. Augustine), the first free school in United States (which was a Catholic school), the first baptism in United States, the first seminary … and the list could go on. During our visit, we got to experience a little bit of that rich history. 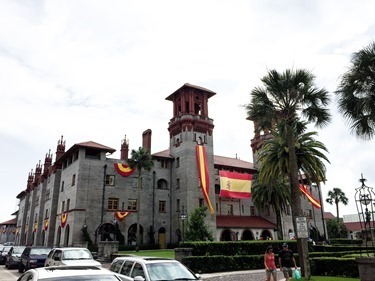 I was somewhat surprised to see the flags and colors of Spain flying throughout the city, but I was reminded that it was a Spanish possession for over 300 years – longer than it has been part of the United States. 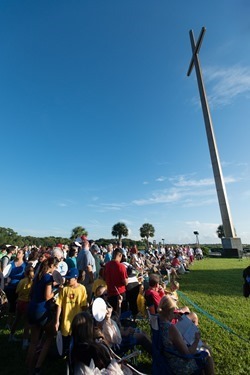 When they celebrated the 400th anniversary 50 years ago, they set up a huge cross which they call the Beacon of the Faith. 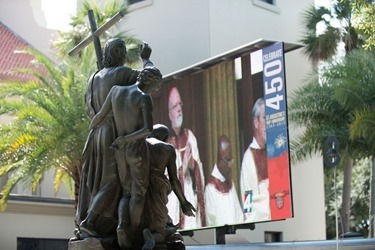 This is a statue of Father Francisco López, the priest who celebrated the first Mass. 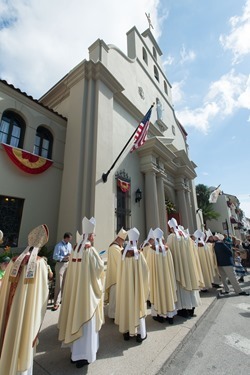 When St. Augustine was established, it was part of the Diocese of Santiago de Cuba, but soon the Spanish Crown sent Irish priests to work there. For example, among the first priests in the settlement was Father Ricardo Arturo (Richard Arthur). 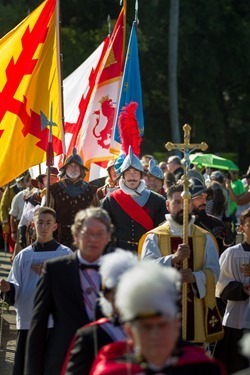 At first blush, it may seem odd that they sent Irish priests to a Spanish colony, but these were Irish priests who spoke Spanish, because the Irish College was in Salamanca, Spain because they couldn’t train priests in Ireland and so they were sent to the continent to study. Another famous Irish priest of St. Augustine was Father Miguel O’Reilly, who became a mentor for Servant of God Felix Varela. 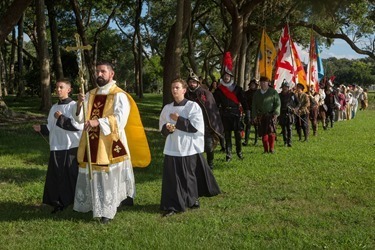 Varela was the grandson of the commander of the Spanish military in Florida and was trained by the Irish priests in St. Augustine. As a young man, with the guidance of Father O’Reilly, he eventually chose to study for the priesthood rather than pursue a military career. He entered the seminary in Havana and was ordained to the priesthood there. He was quite an intellectual and patriot, and was elected to represent Cuba in the Spanish Parliament. But, because of his strong advocacy for Cuban independence, he was eventually condemned and forced to flee for his life. 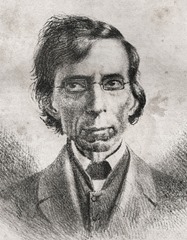 He went to New York, where he became the Vicar General and did a great deal of work with the Irish immigrants. So devoted was he that he even learned how to speak Irish. 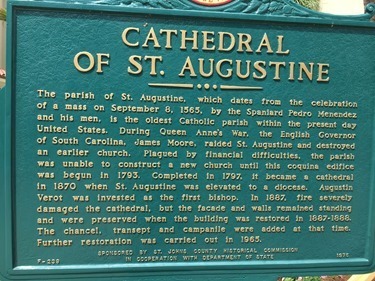 He retired to St. Augustine, where he died a few years later. 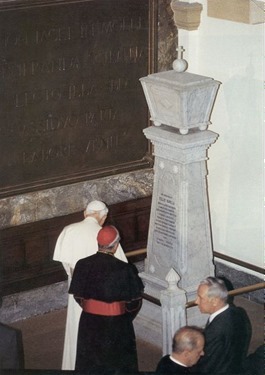 He was eventually reinterred at the University of Havana and Pope John Paul II visited his grave there and honored him during his visit to Cuba in 1998. Servant of God Felix Varela is a very great figure and we look forward to his eventual beatification. 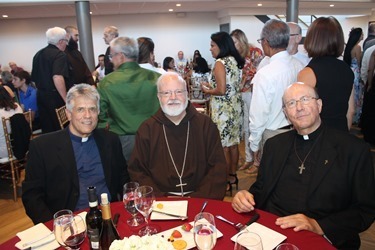 This would certainly be a wonderful event for the people of Cuba, the people of St. Augustine and the people of the Archdiocese of New York where he ministered.